One brand of polish I always forget about because it's not on stores' shelves is Avon. They have some fantastic nail enamels though, and tonight I'm showing you most of their Cosmic line, which features fantastic holographic polishes! Holographic polishes, for those of you who may not know, are peppered with a fine holographic dust, which causes them to reflect tiny rainbows in light, and especially sunlight. For that reason, I've taken all of these swatches in the sunlight, so you'll see that discrepancy from my normal photos. 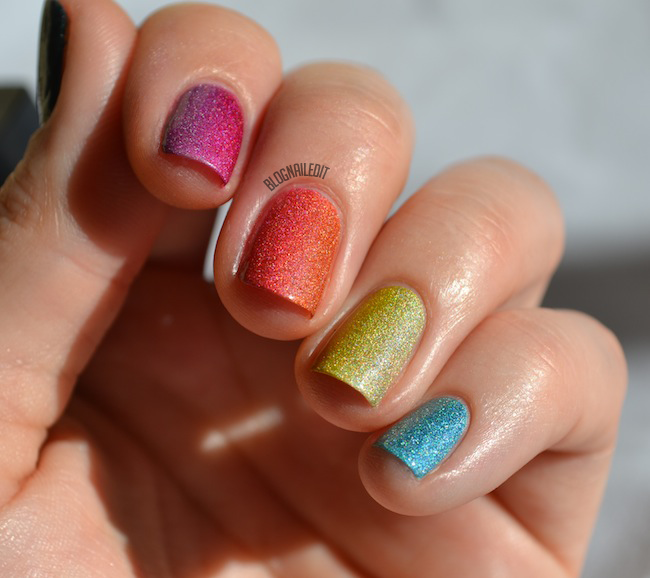 The colors Avon gave me for review came in a gorgeous rainbow, and I thought they'd be perfect as a rainbow gradient across all five nails on one hand. The result is breathtaking! The transition is subtle on the nails, but I love how perfectly they blended together! I can't decide if my index or middle finger is best. Which is your favorite? These polishes were all fantastic! Almost all of them only required two coats for perfect opacity! The only one that didn't was Celestial. Read on for all the swatches and reviews. The first polish is called, appropriately, Eclipse. 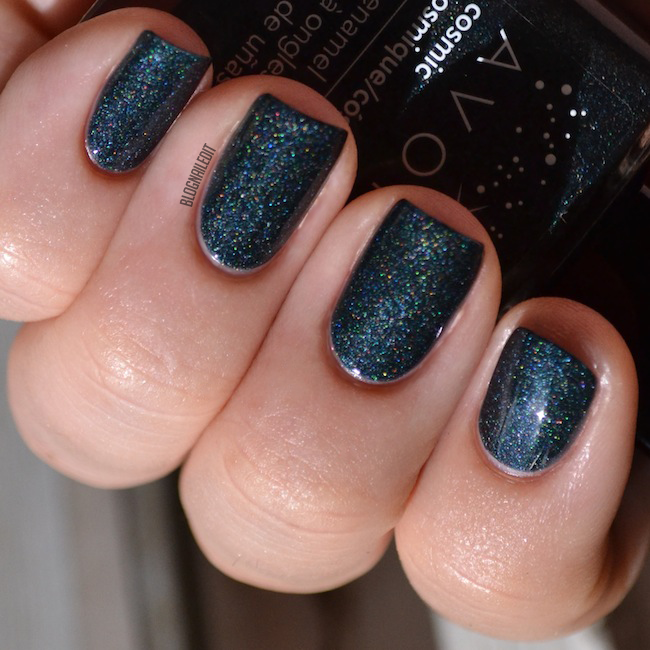 This dark navy, almost black holographic color is totally unique! In the bottle it's nothing fancy, but it really comes to life on your nails. Next is Aurora, a purple-magenta polish. It's not quite a lilac, but also not a jewel color. Somewhere in the middle of those. I used this one, along with Eclipse for my thumb in the gradient. 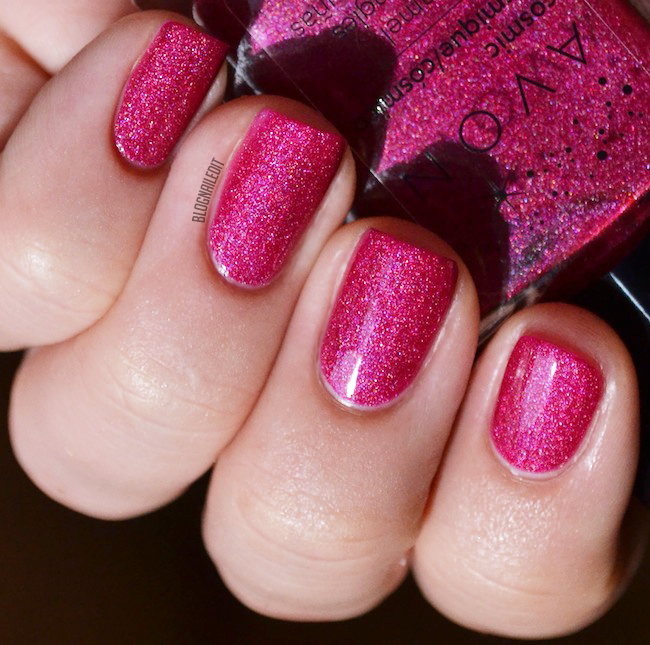 Starburst is one of my favorites because it's such a rich and vibrant pink. Add the holographic dust glitter to it and it really does burst! It's blended with Aurora on my index finger in the gradient. My other favorite is Super Nova. In addition to it being flawless, it makes me want to yell "zetus lapetus" and go crazy over Proto Zoa. Zenon's my jam. 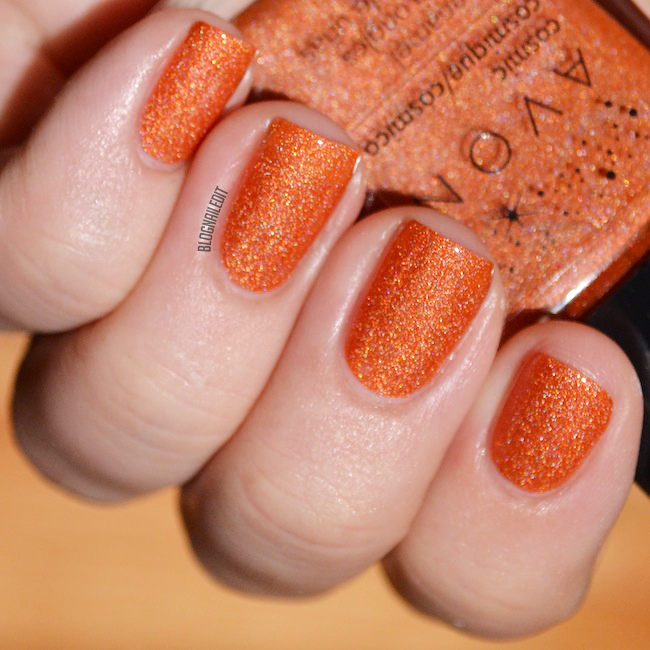 The warm colors of the Cosmic collection continue to be perfect with Saturn, this awesome orange! Why didn't I pull this out for a Halloween look?! Starlight looks almost gold here, but it's actually almost a green! When I was putting together the colors for the gradient, I couldn't decide where to put this initially, because I kept trying to make it a green, when it's really a sort of green-gold-yellow. I feel like some people will hate this, but I'm a huge fan! Radiant is another confusing color, but wow it's pretty! It's more of a muted gold, with definite hints of green. And when I say muted, I don't mean that it's any less holographic! This is Celestial, the one color that I needed to use 3 coats on. It's thinner, but it still applies really well. It's almost like a misty color to me. 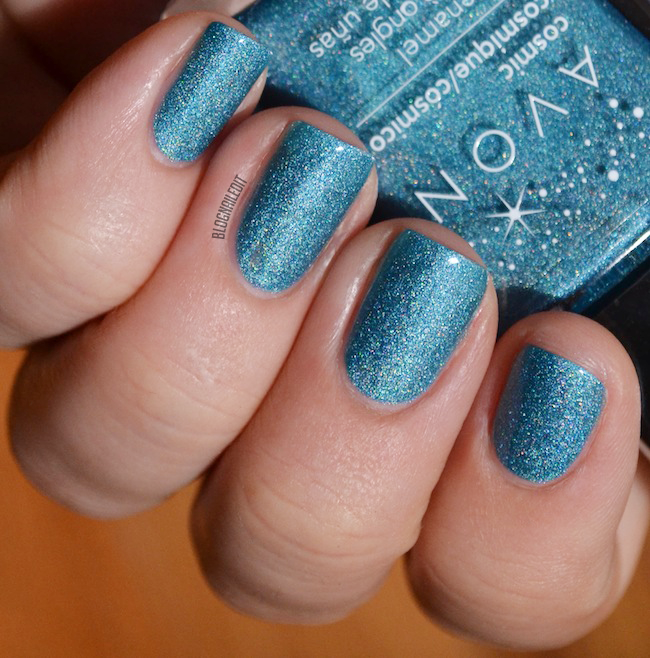 Finally, there's Galaxy, which is a rich turquoise blue. There's one additional color in the collection, called Moonbeam, but I didn't get that for review. You can see Jen the PolishAholic's image of it though from her review post. I loved these holographic polishes and I love the price they're available at even more! Right now, they're on sale through the Avon website for $3.95 each! 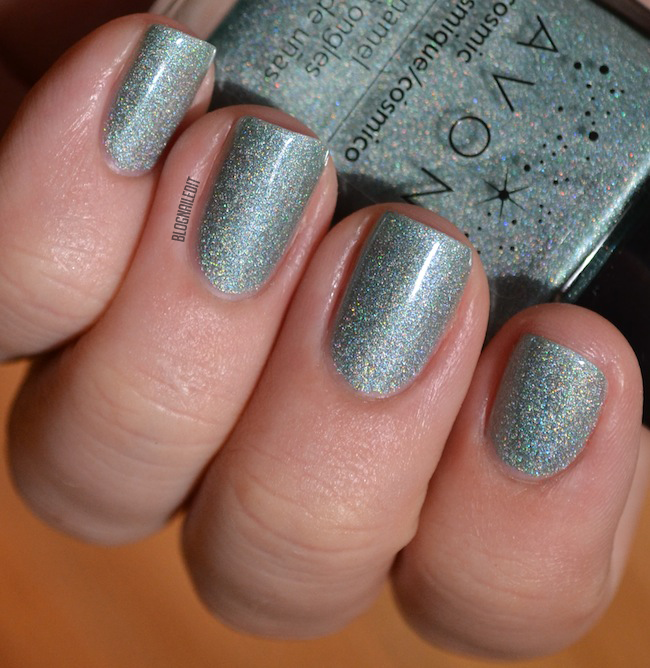 Have you tried holographic polishes before or is this the first you've heard of them? These products were sent to me by Avon. The reviews are based entirely on my experience with the products and were in no way influenced by anyone. They all look so vivid and beautiful! And that rainbow gradient <3 perfect! These are so pretty, and on sale! Hmmm!!!! 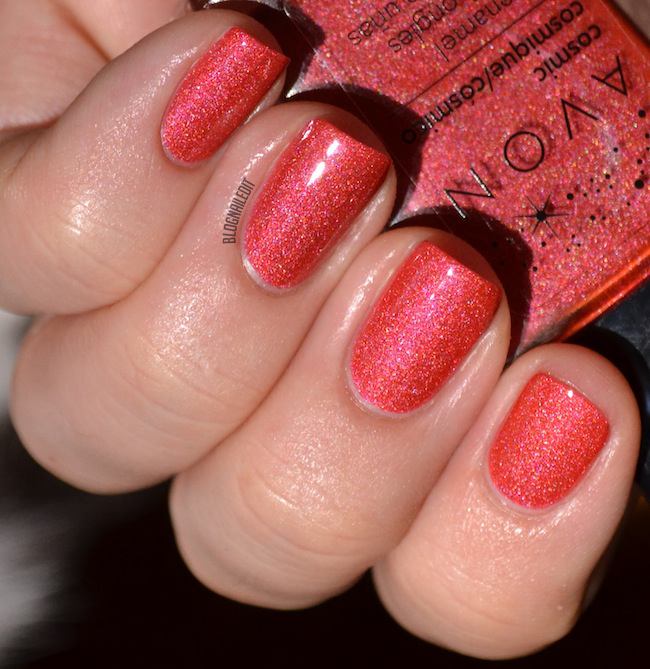 Great swatches and pix! Ahhhh, that gradient is amazing!!! You make these look so good. I just have to keep repeating, "I don't need these, I don't need these". Thanks for the swatches. Gorgeous swatches!! I have Galaxy and Celestial and I LOVE them, they are also both my first holos! I love them all. I'll probably give one a try but first I have to choose one. It's going to be very hard. Do you by chance know if these stamp well or not?